(Phys.org) —Engineers know that gas turbine engines for aircraft and power plants are more efficient and burn less fuel when they run at temperatures high enough to melt metal. But how to raise temperatures and efficiencies without damaging engine parts and pieces? Iowa State University's Hui Hu and Blake Johnson, working away in a tight corner behind the university's big wind tunnel, are developing new technologies to accurately test and improve engine cooling strategies. Their current focus is to improve the turbine blades spun by the engine's exhaust. Those blades at the back of the engine drive front blades that force compressed air into the combustion chamber. "Right now, the current state of the art for engine combustion is about 3,000 degrees Fahrenheit," said Hu, an Iowa State professor of aerospace engineering. "That temperature is above the melting temperature of all engine materials. If you don't have cooling technologies, all the material will melt." One technology is to build hollow turbine blades and blow coolant through an arrangement of holes in the blades. The holes create a cooling film between the hot exhaust gases and the turbine blades, allowing the blades to keep their shape and strength. But now, as manufacturers experiment with biofuels and efficiency improvements, Hu said combustion temperatures are heading higher and higher. And so it's getting more and more important for engineers to research and develop heat-resistant materials and cooling technologies. Better cooling can mean fuel savings, longer-lasting parts and significant cuts in operating costs. For the past 19 months, Hu and Johnson, an Iowa State post-doctoral research associate in aerospace engineering, have been working with the GE Global Research Center in Niskayuna, N.Y., to study turbine blade cooling. 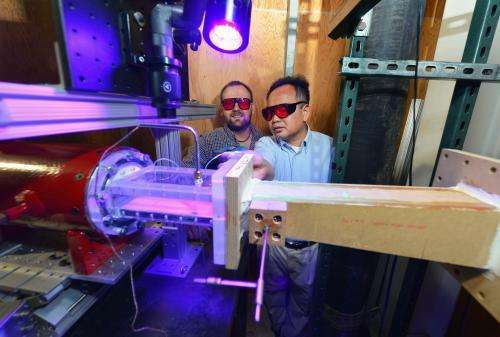 Rather than trying to replicate the high temperatures inside a jet engine, the engineers have developed new technologies and room-temperature tests to study the effectiveness of cooling hole shapes, arrangements and the cooling film they create over a turbine blade. They've built an experimental rig that places a model turbine blade at the bottom of a wind tunnel's test section. Jets of pure nitrogen or carbon dioxide are blown through the model blade's cooling holes. The main stream of the wind tunnel blows oxygen-rich air above the test blade. Using oxygen-sensitive paint on the model blade, an ultraviolet light source and a digital camera, Hu and Johnson can see if the cooling film keeps oxygen molecules from the main stream off the model blade. "If we find an oxygen molecule on the model blade, we know that the cooling stream didn't create a barrier," Hu said. So far, the Iowa State engineers have been working with low-speed flows. They're now building and testing another experimental rig that can handle high-speed flows approaching the speed of sound. They've also been using an advanced flow diagnostic technique called particle image velocimetry – seeding the test flows with tiny particles that can be photographed with a laser and camera – to record and measure what happens when gases blow out of the cooling holes. Those tests provide data about flow structure, thickness of the cooling film, density ratios, velocity ratios and other measurements related to cooling effectiveness. "The big goal of this study is to find anything that GE can do to improve the function of its film cooling system," Johnson said. "Better cooling equals longer-lasting blades. And that could be worth billions of dollars across a fleet of engines." Great! If the efficiency of electricity production with turbines can be improved, it means a reduction of the need for fossil fuels. @Birger - ... and biofuels (food taken away from the poor).